Improved energy efficiency is one of the key drivers for upgrading equipment in IT and data centre environments. When replacing some legacy UPS systems the improvements can be substantial. Uninterruptible power supplies are rated in kVA and kW and for most applications are never expected to be more than 80-90% loaded. This gives 20-10% headroom for load expansion. Above 100% a UPS system would be overloaded and it would either run in this condition for a short period, with or without current-limiting its output or transferring the load through its automatic bypass (static switch) to the raw mains supply. Around 80-90% loaded is where we would consider a traditional UPS system (designed over 10 years ago) to reach its optimal efficiency and for this to be around 90-92%. This means that we are losing up to 10% of the available rating as heat and noise. Within a datacentre environment the heat adds to air conditioning demands as a ‘double-whammy’ increasing running costs. 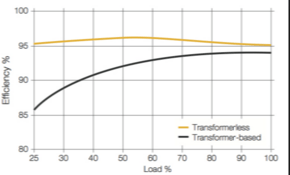 Over the operating lifetime of an uninterruptible power supply, load demands can change. Virtualisation has been the main driver of load change within datacentre and IT environments. It is now not uncommon to find older transformer and transformerless UPS systems running at less than 50% load. Sometimes as low as 25%. As the load is reduced on these older UPS, so their energy efficiency drops; even more so for transformer-based uninterruptible power supplies. To understand the financial implications of UPS operating efficiency we need to look at simple calculation to understand the number of kWh lost per year for each UPS type. It is also to remember that the energy efficiency curve for older UPS systems is non-linear. Operating at 25%, their efficiency can be 70% or less. The following formula can be used to compare the ‘waisted’ energy as a result of operating at less than 100% efficiency. The resultant figures provide a basis for comparing UPS systems at different loads. *Utility charge for a kWh of electricity for your datacentre or IT facility. Assuming 10.5p per kWh for the calculations below. Modular UPS systems are rapidly gaining popularity as a way to right-size a UPS and load application not just on day-one but during the life-time of the power protection system. Using a modular UPS frame, additional UPS modules can be added to increase capacity and improve operational N+X resilience. Another major benefit of these latest transformerless uninterruptible power supply designs is that they have a high operating efficiency and over a much wider operating load curve. On-line operational efficiencies of 97.5% are achievable at 100% and even down to 25% load. Upgrading a legacy uninterruptible power supply to one of the latest modular UPS systems can achieve dramatic improvements in operating efficiency and reduction in operating costs. The formula calculations are dependent on the kWh cost you pay for your datacentre and IT facility suite electricity and depend also on the uninterruptible power supply already in use and the modular UPS system proposed as an upgrade. The figures are provided as a general guide but do demonstrate that upgrading a UPS can be self-financing to the point of break-even around year 3. For a full assessment and project site survey please contact the Eco Power Projects team.